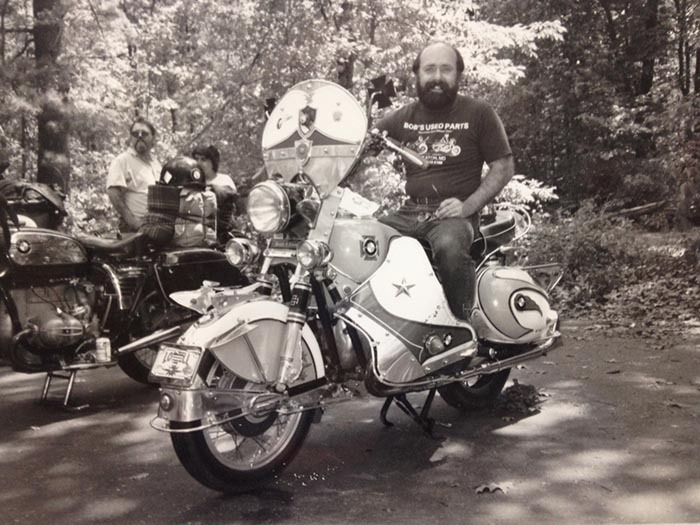 Bob sitting on old BMW twin engine. Yes, that’s really Bob sitting on a very unique old BMW twin, a bike Bob hopes someone out there will be able to assist him in finding. 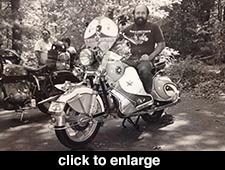 That photo of Bob was back in the days before Bob’s BMW, when it was called Bob’s Used Parts. And judging by the t-shirt he’s wearing it’s even before he moved the operation to Jessup so this is likely circa 1983. Bob was attending an event in New Hampshire called Mayday Madness hosted by the Vintage BMW Owners Club (VBMWO) which was a 2 day Vintage BMW bike gathering, campout and flea market. This was well before the internet. While Bob attended this event many times over the years both selling and acquiring items or just as an enthusiast he only saw this machine show up one time and the owner would not share any contact information. Bob does recall handing over a business card to that nice man who agreed to the photo you see here. Bob has told the staff here about this unique bike many times and he’d still love to acquire it to share in the Vintage Museum at Bob’s BMW so if you know who owns it, where it might be garaged or in some manner can get him information that leads to the acquisition we know there would be a generous finder’s fee involved. Email bob@bobsbmw.com if you have any information to share.